Preheat oven to 350°. With electric mixer in large bowl, cream butter, peanut butter, sugar, and brown sugar. Add eggs and vanilla; mix thoroughly. Add flour, baking soda, and salt; mix until all combined. Stir in mini chocolate chips. Drop big rounded 2″ diameter scoops onto non-greased cookie sheet (I do eight cookies per sheet). Press down with fingers making a disc, then make cross marks with fork. These are big, so I press with fork around each cookie four times. Bake 10-11 minutes. Do not over bake! I pull mine out at 10 minutes so they remain soft inside. Grab a glass of milk and forget cooking dinner! Makes approx 30 big cookies. One bite and I was hooked! I love the consistency, it’s a chewy, dense feel as you bit into the bar. 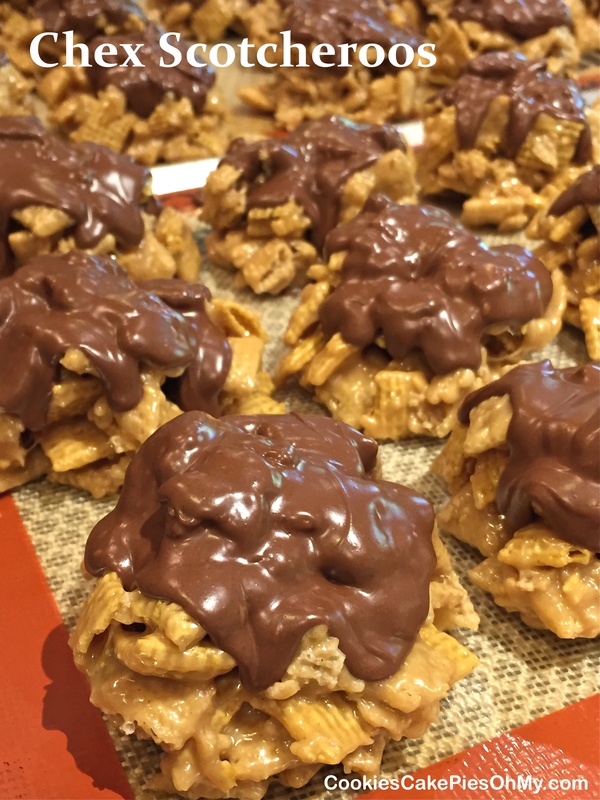 If you are a peanut butter and chocolate fan, this might be your favorite easy bar recipe too. Preheat oven to 350°. Line a 13″x9″ baking pan with foil, leaving overhang, and spray with non-stick spray. In large bowl, cream butter, peanut butter, sugar, and brown sugar. Mix in eggs one at a time. Beat in vanilla. Combine flour, baking powder, and salt; stir into the creamed mixture. Stir in chocolate chips. Spread evenly in prepared pan. Bake 45-50 minutes or until toothpick inserted in center comes out clean. Lay a piece of foil over top of baking pan after about 30 minutes if you think it might get too brown. Cool completely. Remove bars from pan lifting with foil overhang, peel foil away, and cut into bars. 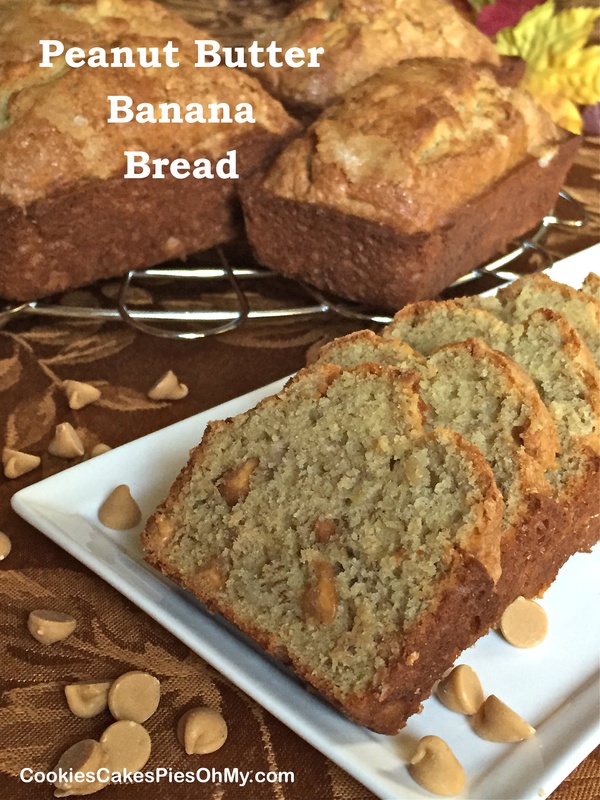 My little twist on banana bread because I love peanut butter! Preheat oven to 350°. Spray 5 small or 2 regular size loaf pans with nonstick spray. In large bowl mixing by hand, cream butter, peanut butter, and sugar. Add eggs and banana; mix thoroughly. In smaller bowl, stir together flour, baking soda, baking powder, and salt. Add vanilla to buttermilk. Add dry ingredients and buttermilk alternately to creamed mixture; mix just until combined. Fold in peanut butter chips. Scoop batter evenly into prepared pans, sprinkle tops with a little sugar if desired. Bake 35 minutes (small loaves), 50 minutes (large loaves) or until golden brown and pick in center comes out clean. Cool in pans at least 15 minutes before removing. Cool completely before slicing for clean slices (usually I can wait, messy slices taste just as good). When our daughter came for a visit she made these delicious healthy bars. The recipe is found at sallysbakingaddiction.com. 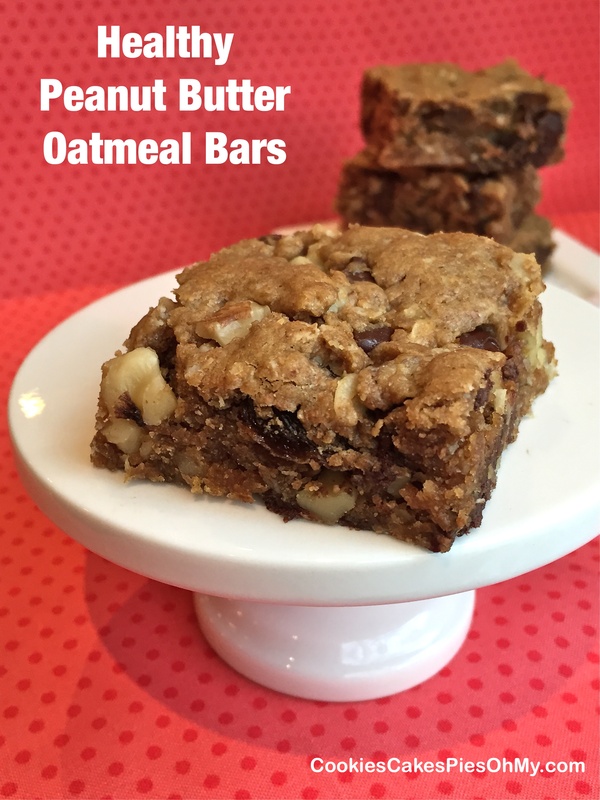 I am thinking maybe the name Healthier Peanut Butter Oatmeal Bars would be better. They probably are healthier than many other dessert bars, but there are still a fair amount of calories in each bar. So, it’s all about portion control, or, do as my husband and I did and just have these bars for dinner! We are so happy…and healthy! Optional add-ins – chocolate chips, butterscotch chips, peanut butter chips, Craisins, pecans, sunflower seeds, etc. Preheat oven to 350°. Line a 8×8 or 9×9 baking pan with foil and spray with nonstick spray. With electric mixer, cream brown sugar and peanut butter. Mix in vanilla. Add flour, oats, baking soda, and salt; mix just until combined. Stir in chocolate chips, raisins, and walnuts (or whatever add-ins you choose). Press dough into prepared baking pan. Bake 17-20 minutes, until bars are lightly golden and set in center. Allow to cool completely and cut into squares. Makes 16 squares, approx 240 calories each. 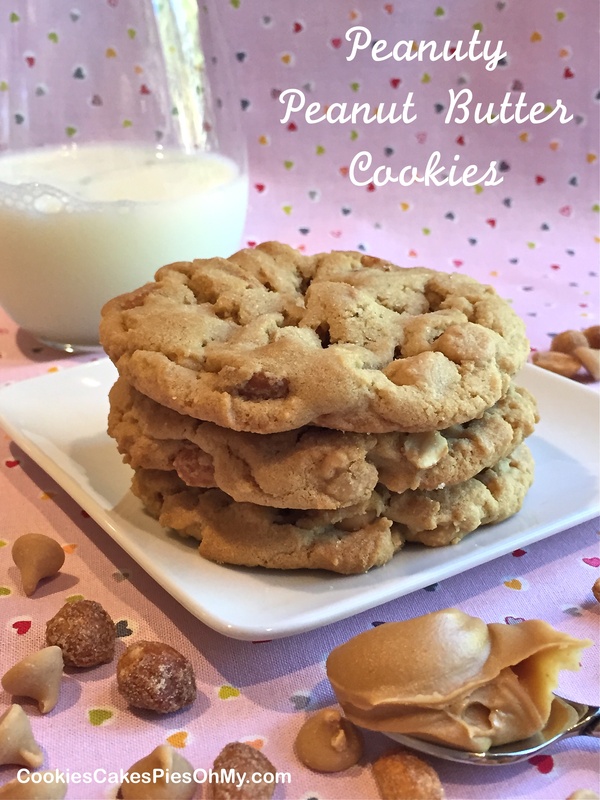 Taking the peanut butter cookie to a higher level of peanuty flavor! Preheat oven to 350°. In large bowl with electric mixer, cream butter, peanut butter, sugar, and brown sugar. Mix in eggs and vanilla. Add flour, baking soda, and salt; mix until just combined. Stir in peanut butter chips and honey roasted peanuts. Drop rounded scoops (about 2 Tbl) of batter onto ungreased cookie sheet. Press down with bottom of glass dipped in sugar. Bake 11-12 minutes, remove just before cookies start to brown. Let cool on cookie sheet for 10 minutes, remove to cooling rack to cool completely. Make about 44 cookies. Of course adding chocolate chips would be absolutely wonderful!